STATS DAD: The Growing Youth Sports Economy - Is it Good or Bad for our Kids? 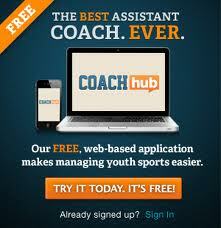 The Growing Youth Sports Economy - Is it Good or Bad for our Kids? I spend a considerable amount on money on youth sports. Actually, one of the reasons I started this blog was to track how much I was spending. I didn't do this to live within a budget -- I had no intentions of spending less -- I was just curious. And I wanted to spark conversation with people who are equally enthusiastic or / and foolish. 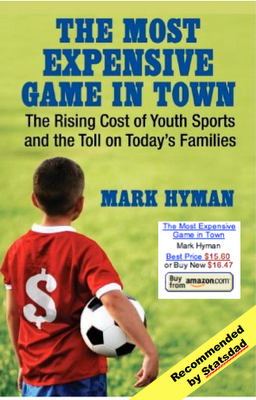 My youth sports cost list has sparked many conversations, including one with Mark Hyman, sports journalist and author. In late 2010, Mark interviewed me for his second book on youth sports called, The Most Expensive Game in Town - The Rising Cost of Youth Sports and the Toll on Today's Families. I answered his questions, and to tell you the truth, I was a bit nervous about how I was going to be portrayed - our behavior regarding youth sports is not exactly rational. The book was recently released and Mark sent me a copy. When the package arrived from Beacon Press, I hesitated. I didn't hesitate as long as I did before I opened my SAT scores, but it was close. I finally opened the book and immediately went to the index to see if my name was mentioned in the book and on what page. To my surprise, I was mentioned on 6 pages, including page 1 of the book in the chapter called the Parent Trap. In this chapter, Mark told the stories of three families and also revealed that he was more like me than not. The book explores so many interesting topics surrounding the economy of youth sports. Mark follows the dollars and explores the motivations of the people who spend their money on youth sports and the people who earn money from youth sports. He explores both sides of the financial equation in a respectful way while exposing some of his own misguided sports expenditures. The book will make you think. And after you read the last page, you will close the book and wonder if kids would be better off without the influence of money. In the book, you will find an interesting story about small money-strapped towns betting on youth sports meccas to bail them out of their financial woes. Mark also explores the influence of big corporation money from companies like ESPN, Gatorade, Nike and Pepsi. Stories about the Ford sponsored Punt Pass and Kick competition and the invention of the aluminum bat brought back memories for my wife and me. My athletic wife competed in the PP&K and I used a gold painted Worth metal bat in 1970, the year that it was introduced and changed youth baseball forever. Many parents spend money on youth sports in hopes of giving their kids a chance to earn a scholarship or a pro contract. If this were our goal, then our expenditures on youth sports would be considered questionable. That is not our goal. My kids and I both know the slim to none chances of playing sports at advanced levels (college and pros). I write about this a lot in my blog. Our goal is to have fun and learn what it takes to succeed in life. Sports teaches so many life lessons. (I write about this often too) At the end of their sports careers - whether it ends by getting cut by a HS coach or retiring from the pros after a successful career - I think that my kids will know how to set goals, work hard, work for demanding bosses, work with teammates, succeed under pressure, seek out experts for advice and persevere - lessons that will serve them well in life. I enjoyed reading your post and we spend a lot of money on youth sports for our children also. I think in Australia there is even less chance of going pro. A major reason I support and encourage involvement of my kids in sport is to keep them strong and healthy. I also hope that they will continue their sport, even at a recreational level thought their lives. Exercise is a vital part of maintaining a healthy lifestyle....for everyone! It seems our worlds are not really that far apart. Thanks for sharing. Wow - what a powerful and persuasive study - I will write a post on it to help raise awareness. Thanks so much for sharing it. Glad to hear that while you "spend" you are aware that you're not doing so to earn scholarships and pro contracts. We made the decision early in our oldest son's athletic career to not play traveling hockey. While I don't condemn those who do I have always wondered about the added pressure placed on our kids when parents invest so much money and time. Keep up the good work. We have spent a lot of money on baseball over the years. Recently, my son decided that he is going to concentrate on golf. Arm troubles helped him make that decision. He loves baseball and was very bummed. He mentioned how much time he invested and how much money we have spent. I told him that all of that money and preparation was to prepare him for any competition - school, other sports, jobs, etc.